Are you interested in purchasing one-of-a-kind handcrafted and custom-woven seed bead jewelry for yourself or someone you love? MB Designs specializes in creating custom necklaces, earrings, bracelets and more for customers. Owner Muriel Badinelli first started designing her jewelry back in 2010 as a hobby, and ever since then she has used classic bead weaving techniques to create some of the most beautiful jewelry you can find. MB Designs can provide you with jewelry that will stand out in the crowd, and you will definitely want to add more pieces to your collection over time once you realize how many compliments you will get when you wear jewelry created by MB Designs. When you come to MB Designs, you will be able to browse all of the latest jewelry designs that Muriel has to offer. From carefully crafted necklaces that incorporate fine materials like gemstones and sterling silver to bracelets finished with 14-karat gold-filled clasps and Swarovski crystals, the jewelry you’ll find at MB Designs is second to none. MB Designs has handcrafted and custom woven-seed bead jewelry that you simply won’t find anywhere else. In addition to providing you with a large selection of fine jewelry, MB Designs can also work one-on-one with customers to come up with a design that is completely customized. MB Designs wants you to fall in love with your new piece of jewelry, so you can play an integral role in picking out exactly what you want your creation to look like. You can add your own special touches to your jewelry, and with the help of MB Designs, you won’t feel overwhelmed by the process. You will have so much fun when you work with MB Designs to create custom handmade woven seed bead jewelry. See something you like, or have questions about custom jewelry designs? Contact MB Designs for more information today. Muriel Badinelli started designing jewelry as a hobby in 2010 – it has now become her passion. When friends and family began asking for custom pieces after seeing her designs, Muriel took the leap into a jewelry business. 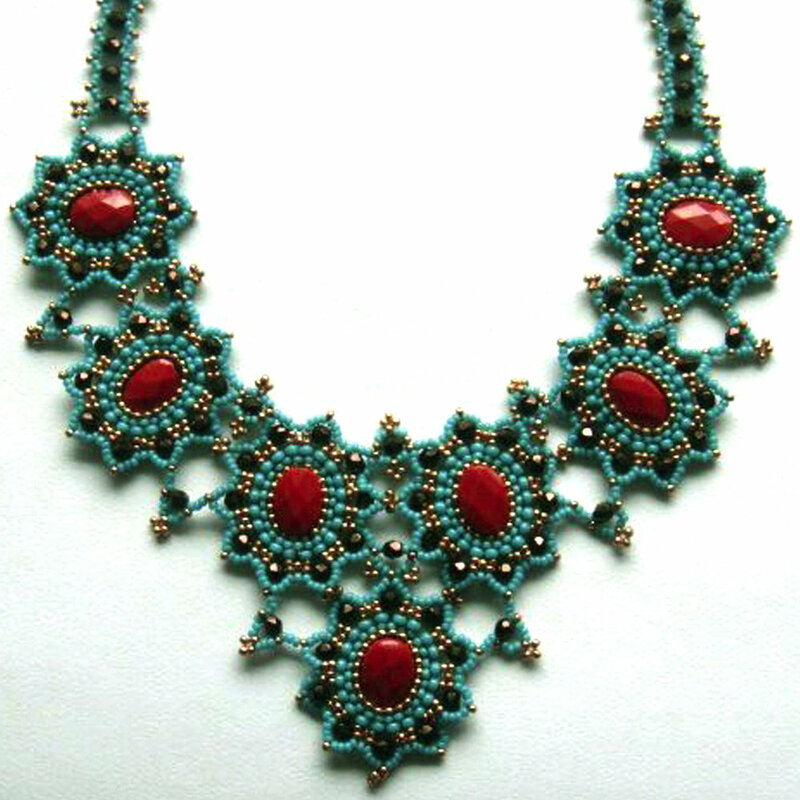 Her studio is located in Redding, CT.
After a while, Muriel began creating jewelry using classic bead weaving techniques, with seed beads, gemstones, Czech fire-polished beads and Swarovski crystals. This has become her favorite form of jewelry design. The finest materials are used in making MB Designs jewelry – gemstones, sterling silver and 14kt gold-filled clasps and ear wires, as well as Swarovski crystals and pearls. Her style influences come from fashion, art, vintage jewelry, nature, texture and color. The Jewelry Cafe in Woodbury, CT.
and Sugarbeads & More in Ridgefield, CT.
Muriel loves working one-on-one with customers to create the “perfect” piece of jewelry. Each piece is hand created by Muriel personally – a piece that complements your lifestyle, your personal style and your unique qualities. Nothing is ever outsourced or purchased elsewhere. In addition to the designs on this site, Muriel is happy to create a custom design to suit your style and needs. Be sure to contact her.